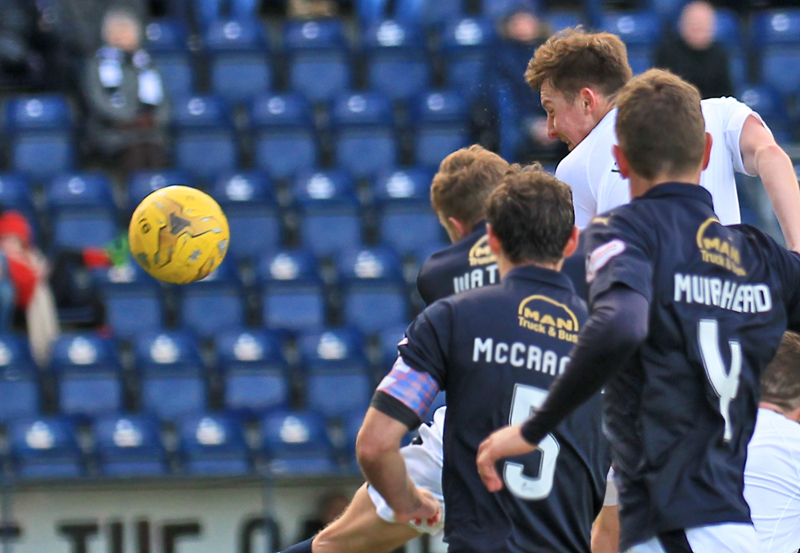 It was a game of two halves at Falkirk this afternoon as Queens fell to a 3-1 defeat to the Bairns. A Chris Higgins header put Queens in pole position at half time but second half goals from John Baird, an own goal from Andy Dowie and a late Blair Altson strike made sure the three points stayed in Falkirk. After last weeks narrow defeat to top of the league Rangers, James Fowler made three changes to his starting eleven. Top goal scorer Derek Lyle couldn`t shrug off the knock he picked up last time out so Iain Russell would lead the line for the Doonhamers. Kyle Jacobs made his first start since January replacing Lewis Kidd, slotting into the right back position where he has played on a couple of occasions already this campaign. On-loan Andy Murdoch returned to the side, after being ineligible to play against his parent club last week, replacing ex-Bairn Mark Millar. Dale Hilson was named on the Queens bench for the first time since September after a spell out on the side-lines. 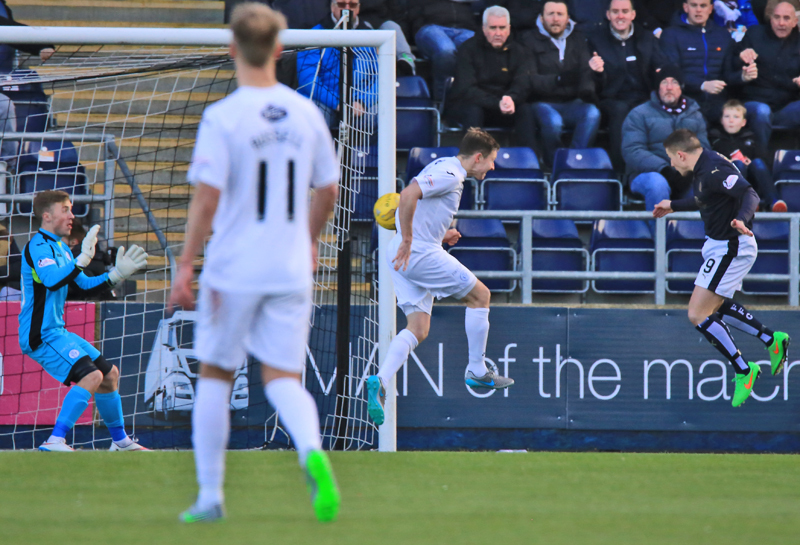 Queens` last three visits to The Falkirk Stadium has ended with both sides earing a share of the spoils, the most recent being the stalemate on a cold Friday evening where both failed to warm up the fans in attendance. The Falkirk Stadium hasn`t been a happy hunting ground for us in recent times as Queens has failed to win in their last seven attempts, you have to go back to January 2011 to find the last time we left with a victory here, a Allan Johnston double sandwiched between a Colin McMenamin goal made sure the Doonhamers travelled back to Palmerston with the three points. 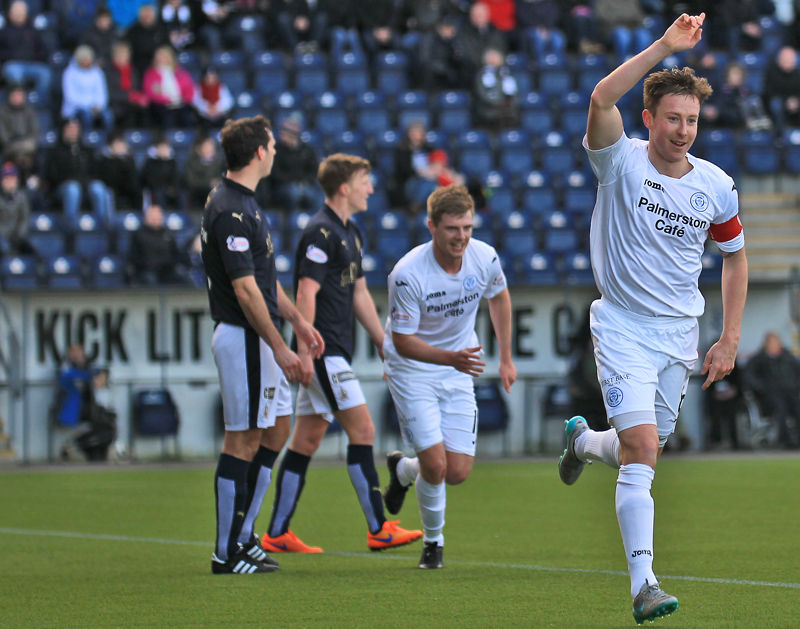 Both encounters this season with The Bairns had finished in draws, 0-0 at The Falkirk Stadium and an entertaining 2-2 draw at Palmerston in November. It was a slow start to the proceedings with no real clear cut chances created in the opening ten minutes. The home outfit were beginning to threaten and slightly edging possession. Craig Sibbald found space on the right hand side but his cross was straight into the path of the Queens goalkeeper Jim Atkinson. Sibbald continued to light up the match with a bit of magic, the midfielder skilfully got past Murdoch but his floating ball to Blair Alston was just too heavy and Atkinson collected the ball with ease. Queens started to find their feet and the ever present Kyle Hutton was thick in the action, his superb vision picked out Jake Pickard and looked to have sent the youngster through on goal but he couldn`t time his run and was flagged offside on the 23rd minute. Falkirk were having more of the ball but were wasteful on the ball and when they the home side lost the ball Queens were looking dangerous on the break. Altson beats off Jacobs and forced the South African to concede a corner, but all his good work was wasted as his corner kick was too deep and cleared away by Hutton. The first shot on target came 27 minutes on the clock. Hippolyte created space on the right hand side but his deflected effort fell straight into the arms of Atkinson. Both keepers could have had a lie down for the opening twenty minutes but finally Rogers was called into action half an hour into the match. 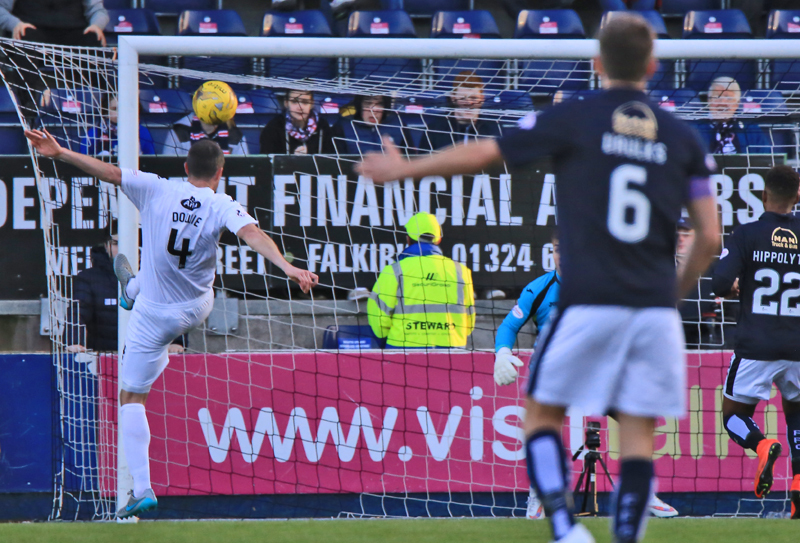 Alex Harris got past Aaron Muirhead and the Falkirk goalkeeper had to be on his toes as the winger`s cross was drilled into the six yard box and punched to safety by Rogers. The match was beginning to open up and the away side could have taken the lead on the 33rd minute. Iain Russell fought off David McCraken deep into the Falkirk half and let loose from 18-yards out but his shot cannoned off of Peter Watson. Seconds later Andy Murdoch seen Pickard peel off his marker and his through ball found Pickard but his first touch was too heavy and Rogers collected the ball. The Falkirk fans begun to voice their displeasure at their team`s lacklustre performance and their frustrations continued when Luke Leahy received the ball on the edge of the box, but the left back`s strike summed up the first half and went well over the bar. Peter Houston`s men had another chance moments later, ex-Queens striker John Baird managed to squeeze past Andy Dowie and fired his shot across goal which Atkinson managed to hold. Just when everyone thought the first half would end goalless,the deadlock was finally broken on the brink of half time. After Russell was fouled by former Queens midfielder Mark Kerr on the 43rd minute. Ryan Conroy`s in-swinging free-kick found captain Chris Higgins, who nodded home his first goal of the season to the delight of the 218 travelling Doonhamers. It was the away side`s first shot on target and seconds later referee William Collum blew for the interval. There were no changes at the break for either side and the only early chance of note was Hippolytes poor header which couldn`t trouble Jim Atkinson. Peter Houston decided to make a substitution and a change of formation eight minutes into the second period. 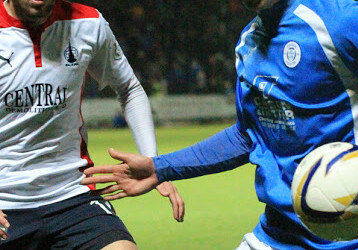 Experienced striker Lee Miller replaced defender David McCracken and his introduction immediately had an impact as with only seconds on the pitch The Bairns equalised. Miller played the ball wide to Hippolyte whose cross found John Baird and he headed home despite the efforts of Atkinson. The leveller looked to have gave the hosts confidence but were caught out when a slack pass from Leahy fell to Russell and Muirhead fouled Russell. The ex-Annan defender was cautioned for his troubles. James Fowler made his first change of the afternoon, Gary Oliver replacing Alex Harris. Another goal was on the horizon and it came for the home side in the cruellest of circumstances. Andy Dowie- who made his 100th start for The Doonhamers today- sliced his clearance from a Baird cross past Atkinson and into the back of the net. It was a bitter blow for the Queens defender, who had been solid all afternoon. The home side continued to attack and double their lead, Sibbald`s cross found Miller in the box but his glancing header was inches wide. Queens tried to salvage something from the game with the introductions of Aidan Smith and the returning Dale Hilson but whilst adding pace to the attack they couldn`t create any real chances to equalise. The home side wrapped up the victory with five minutes to go, Blair Alston found space inside the box and from ten yards out drilled his strike into the bottom corner of Atkinson`s goal. Both teams had chances to score late on. 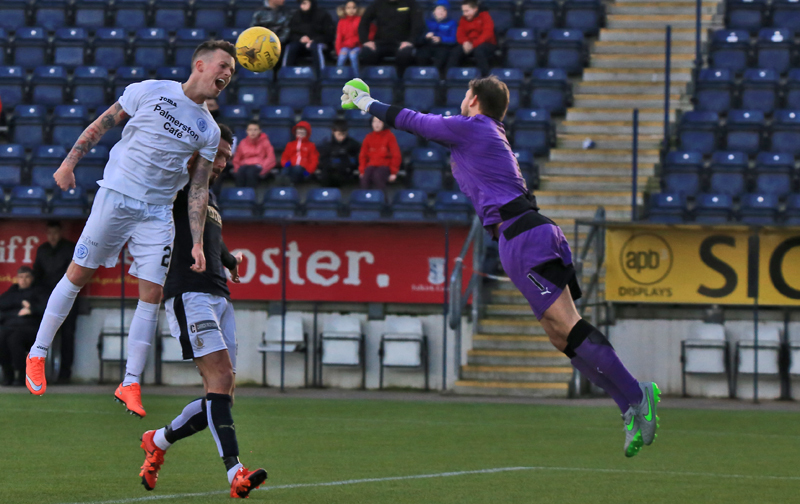 Andy Dowie had his effort blocked and young Falkirk striker Jamie O`Hara couldn`t connect to Sibbald`s cutback. 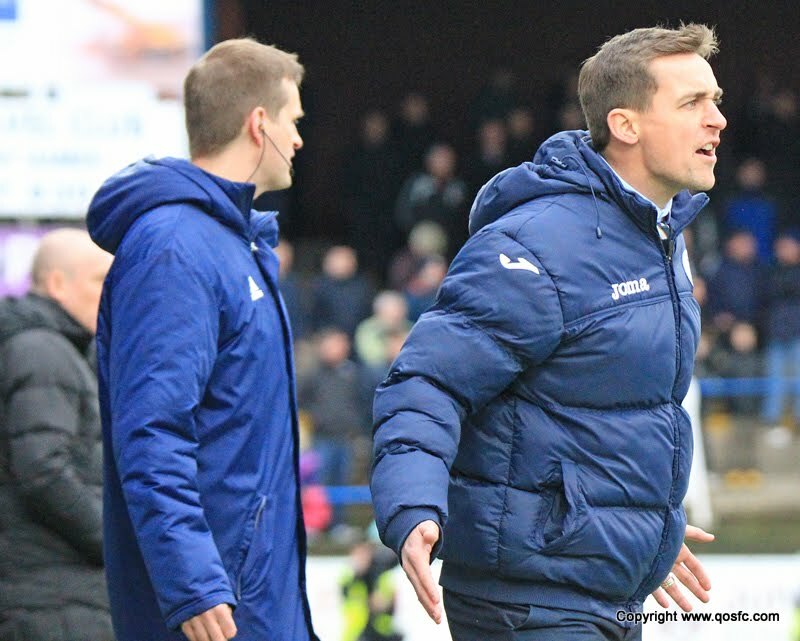 It was a difficult afternoon for The Doonhamers against an in-form Falkirk side at a ground where Queens tend to struggle. The result keeps Queens in 6th place in The Championship four points from the final play-off position. 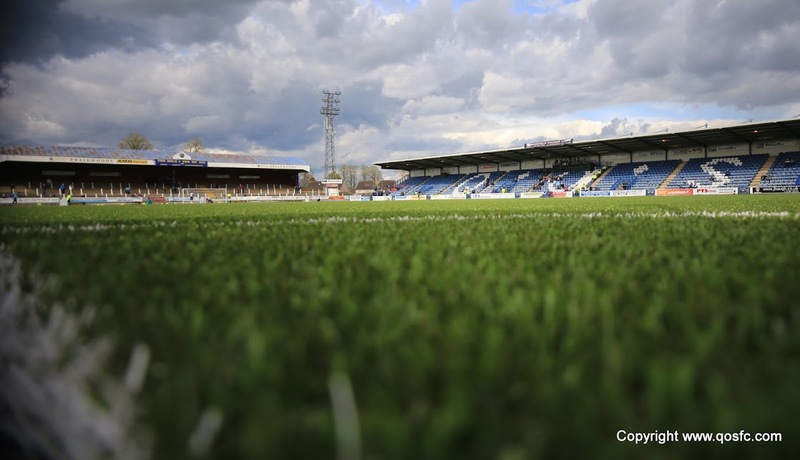 Next up we play Hibernian at Palmerston Park on Tuesday evening. 14:21 Three changes for Queens this afternoon. Russell, Jacobs and Murdoch replace Lyle, Millar and Kidd. 14:23 Falkirk XI; Rogers, Leahy, Muirhead, McCracken, Vaulks, Alston, Baird, Sibbald, Kerr, Hippolyte, Watson. 14:24 Today`s referee is William Collum and assistants are Sean Carr and Callum Spence. 14:26 Queens last three visits to The Falkirk Stadium have finished in draws. 14:27 Our two previous meetings with The Bairns this season have both ended with both teams earning a share of the spoils. 10 min It has been a slow start for both teams with no real chances created. 27 min First shot on target of the match. Hippolyte fires in a shot from 18 yards out but is saved by Atkinson. 37 min Baird has a shot from 11 yards out but Atkinson makes an easy save. 58 min Muirhead cautioned for a foul on Russell. 66 min Falkirk take the lead here . Hippolyte`s cross is headed in by Dowie. 85 min Alston fires the ball into the bottom right hand corner of the net.